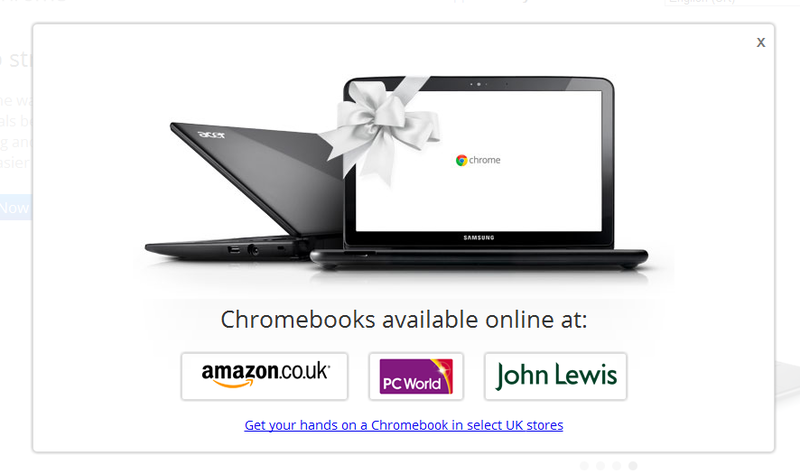 Google started promoting their Chromebooks via the Chrome browser dial screen a few days ago - but I've only just seen the message arrive in the UK. It's both an obvious thing for Google to do - promote their hardware; as the promotion is needed - and a surprising one. After all, I think Google is busy trying to persuade people they don't use their platform to promote their products (well, perhaps that debate only applies to search). The link goes to this page which shows off a range of Chromebooks. The buy button to a landing page that kicks off with Amazon, PC World and John Lewis buttons. It's the sort of landing page Google would give an awfully poor Quality Score to if someone pointed a PPC ad at. As Google would have expected the results of the "ad" appearing aren't always pleasing. There is already a help thread of people asking how to remove it and at least one user has uninstalled Chrome, the browser, as a result.